Posing this to my AUSA friend: What happens legally to Jim Gordon now that the Dent lie has been exposed? Does Gordon get a happy ending? Keeping in mind that we have no idea what the laws are in Gotham State (the police keeping Robin John Blake on the other side of the bridge were Gotham State Police, so in The Dark Knight Trilogy we have firmly established that the city and state are both fictional), the only law that I can think of that Gordon would have broken would be making false statements to the police. This assumes that there was an official investigation into Dent's death and that, as part of that investigation Gordon falsely told the investigating officers that Batman killed Dent and Dent's victims; fairly safe assumptions. However, at least on the federal level, that crime has a 5 year statute of limitations. The Dark Knight Rises takes place 8 years after Dent's death. If the same statute of limitations applied in Gotham State, then Gordon could not be prosecuted. Of course, there should still be an internal affairs investigation that could cost him his badge, and, politically, whomever replaces blown-up Mayor Batmanuel could just fire him as Commissioner, but I'm betting after helping save Gotham from nuclear annihilation Gordon re-cemented his position as a hero and he would be untouchable politically. For that matter, even if he did break the law regarding Dent's death, no prosecutor in his right mind would actually bring charges. So, I think it is a happy ending for our old friend Jim Gordon. 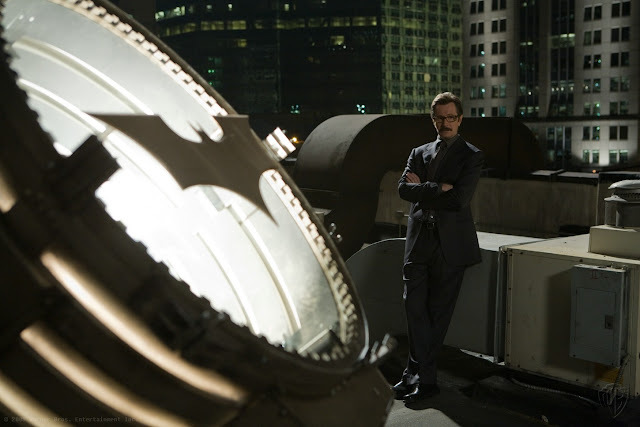 He gets to light that brand new Batsignal and call forth Robin John Blake to his heart's content.